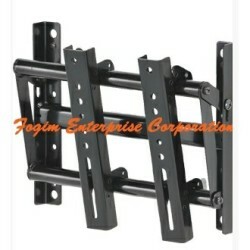 FOGIM specializes in high quality LCD and Plasma TV Wall Mounts. The TV mount series apply to LCD and plasma TV from 32" up to 60". We offer clear instructions for installing each TV mount. Both LCD and Plasma TV Wall Mounts are designed very simple and easy to install. It is definitely no time consuming for applying such as product. With dedication to innovation, FOGIM is recognized as one of major manufacturers and suppliers in the industry of TV mounts. To deliver the best quality, all products are thoroughly inspected and checked by the quality control staff before dispatch. Find more TV mounts? Please browse the following details about LCD and Plasma TV Wall Mount and feel free to send us inquiries.